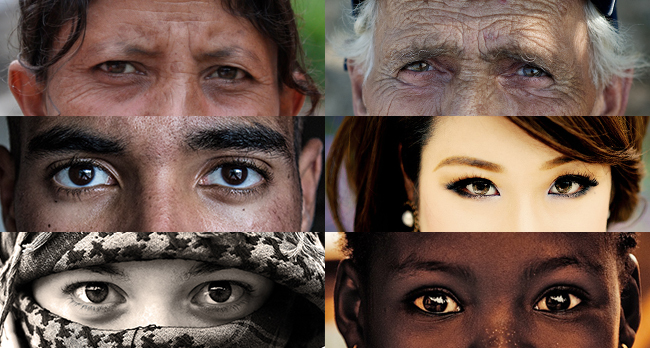 The eye is the major sensory organ involved in vision. 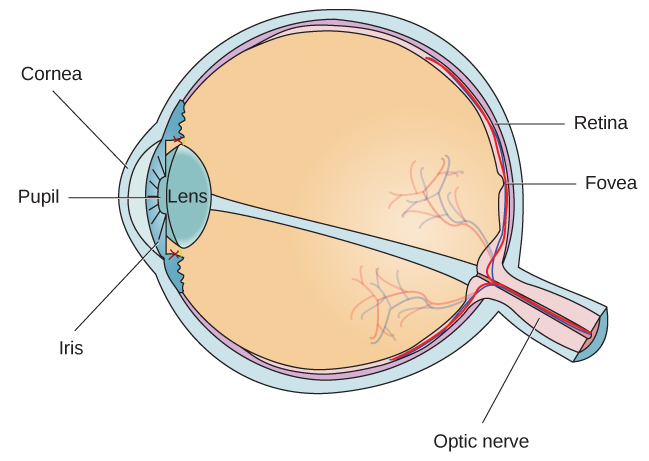 Light waves are transmitted across the cornea and enter the eye through the pupil. The cornea is the transparent covering over the eye. It serves as a barrier between the inner eye and the outside world, and it is involved in focusing light waves that enter the eye. The pupil is the small opening in the eye through which light passes, and the size of the pupil can change as a function of light levels as well as emotional arousal. When light levels are low, the pupil will become dilated, or expanded, to allow more light to enter the eye. When light levels are high, the pupil will constrict, or become smaller, to reduce the amount of light that enters the eye. The pupil’s size is controlled by muscles that are connected to the iris, which is the colored portion of the eye. After passing through the pupil, light crosses the lens, a curved, transparent structure that serves to provide additional focus. The lens is attached to muscles that can change its shape to aid in focusing light that is reflected from near or far objects. In a normal-sighted individual, the lens will focus images perfectly on a small indentation in the back of the eye known as the fovea, which is part of the retina, the light-sensitive lining of the eye. The fovea contains densely packed specialized photoreceptor cells. These photoreceptor cells, known as cones, are light-detecting cells. 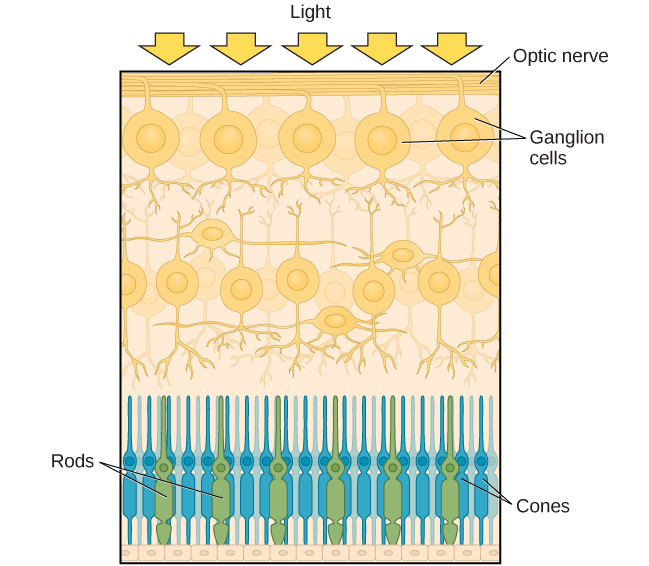 The cones are specialized types of photoreceptors that work best in bright light conditions. Cones are very sensitive to acute detail and provide tremendous spatial resolution. They also are directly involved in our ability to perceive color. 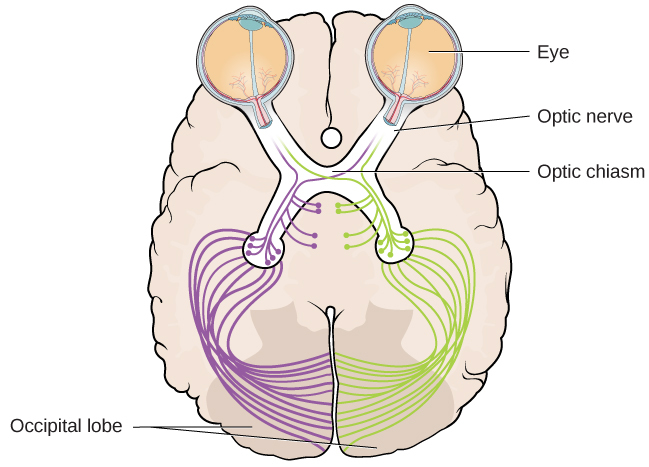 The optic nerve from each eye merges just below the brain at a point called the optic chiasm. As the following Figure shows, the optic chiasm is an X-shaped structure that sits just below the cerebral cortex at the front of the brain. At the point of the optic chiasm, information from the right visual field (which comes from both eyes) is sent to the left side of the brain, and information from the left visual field is sent to the right side of the brain. Normal-sighted individuals have three different types of cones that mediate color vision. Each of these cone types is maximally sensitive to a slightly different wavelength of light. 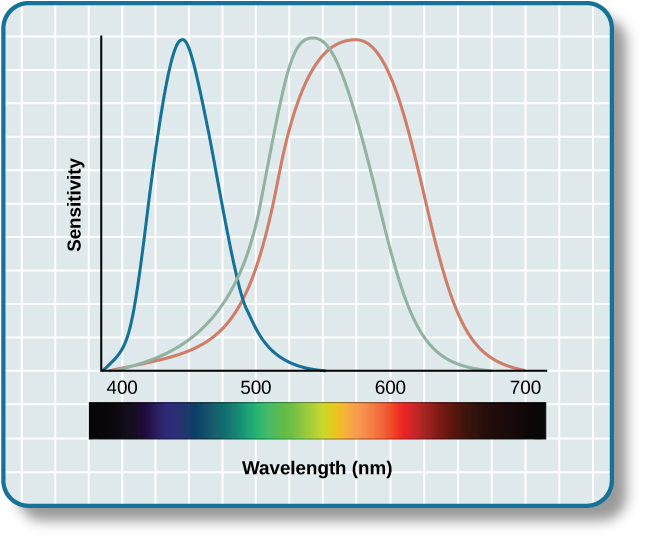 According to the trichromatic theory of color vision, shown in the following Figure, all colors in the spectrum can be produced by combining red, green, and blue. The three types of cones are each receptive to one of the colors. The trichromatic theory of color vision is not the only theory—another major theory of color vision is known as the opponent-process theory. According to this theory, color is coded in opponent pairs: black-white, yellow-blue, and green-red. The basic idea is that some cells of the visual system are excited by one of the opponent colors and inhibited by the other. So, a cell that was excited by wavelengths associated with green would be inhibited by wavelengths associated with red, and vice versa. One of the implications of opponent processing is that we do not experience greenish-reds or yellowish-blues as colors. Another implication is that this leads to the experience of negative afterimages. An afterimage describes the continuation of a visual sensation after removal of the stimulus. For example, when you stare briefly at the sun and then look away from it, you may still perceive a spot of light although the stimulus (the sun) has been removed. When color is involved in the stimulus, the color pairings identified in the opponent-process theory lead to a negative afterimage. 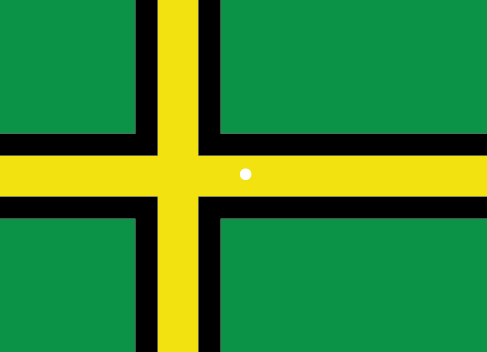 You can test this concept using the flag in the following Figure. An example of a monocular cue would be what is known as linear perspective. Linear perspective refers to the fact that we perceive depth when we see two parallel lines that seem to converge in an image. 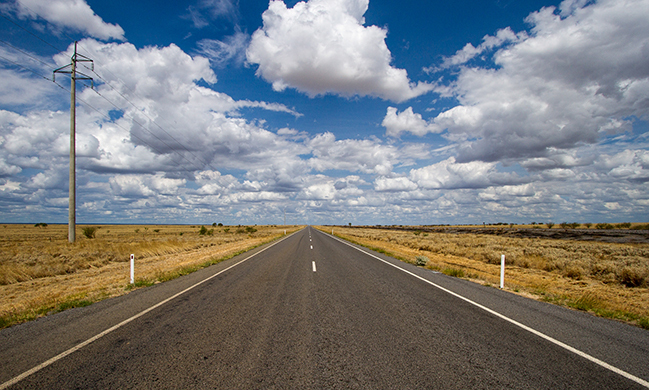 Some other monocular depth cues are interposition, the partial overlap of objects, and the relative size and closeness of images to the horizon. Vision by Rajiv Jhangiani, Ph.D. is licensed under a Creative Commons Attribution 4.0 International License, except where otherwise noted.